Koei Tecmo’s latest title is the fast-paced, action-oriented, giant monster slicing fest based on the anime of the same franchise, Attack on Titan. For people who are desperately waiting for season 2 to come along, this game comes as a great walk down the memory lane, as it is completely based on the first season. A.O.T Wings of Freedom follows the anime like a slave. It’s not that we’re happy about it, it’s just that the first season got over a long time ago, so it would’ve been good to a better glimpse of what’s more to come. The game is exactly what you’d call graphic intensive, but that doesn’t mean it looks bad. The dynamic and fluid animations make the fighting sequences really satisfying. And the cut scenes are amazing too, and provide a pleasant relief amongst all the Titan slaughtering. The freedom in movement is where A.O.T Wings of Freedom really nails it. Sure, the general movement feels a little clumsy outside the battlefield, and you bump into people and objects quite a few times, but once you enter combat mode, that’s where the fun begins. The ODM Gear, makes you fly around the city, and apart from the occasional collisions with the buildings, it feels majestic. You can attach yourselves to one of the five parts of the Titan’s body, any of the 4 limbs, or the nape, circle around and slash the target body part with your dual blades. Now, cutting off the limbs it optional in the game, save a few boss Titans. It’s the nape you really need to get rid of to kill the monsters. As the resources and weapons are also limited, you need to make sure you’re well stocked before you fo swinging into the face of a Titan. Thankfully, there are plenty of logisticians on the battlefield you keep you supplied. And that probably sums up the good parts. You’ll probably spend the first couple of hours amazed by the spectacular mechanics. I’m pretty sure that everyone who’s seen the anime was pretty jealous to see the reputed scout regiment’s elegant and flawless Titan slaying tactics, so you’ll spend a lot of time just flying around and having fun. But as you slice your way through Titans, you’ll realize there’s nothing more to the game in terms of what the player can do. Then begins the repetitive game of grind. The worst part about it is probably the ease with which you can kill almost every Titan with a single hit, apart from a few boss fights. Geez, where’s the challenge? 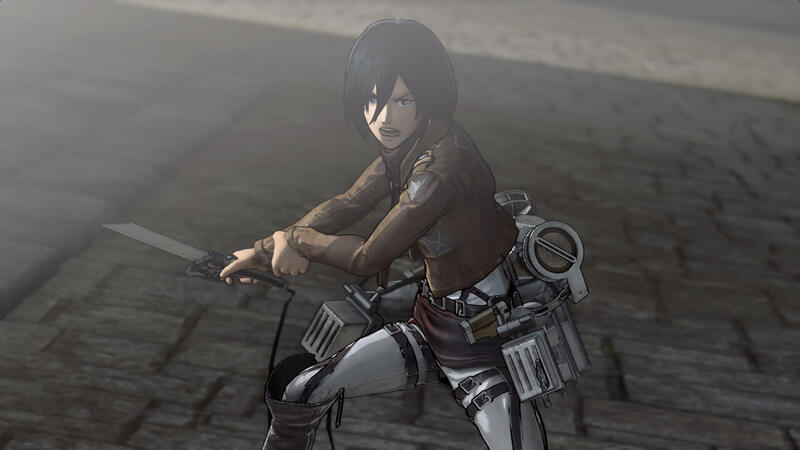 Another problem along similar lines – in the anime, Mikasa is respected for the fact that she has slaughtered around a dozen Titans. In the game, you kill more than that in during a single mission. Sooner or later, you just aim for the nape and move on to the next one, and it’s easy to lose interest over time. 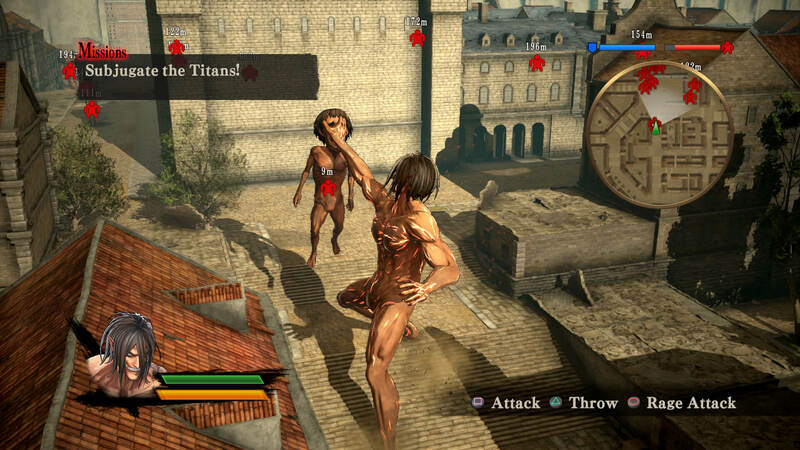 I mean, it would be stupid if the game about killing Titans wasn’t infested with the giant buggers, it’s just that there could have been something more to grab the player’s attention. There’s also little in terms of character differentiation, as you don’t really get to do much apart from killing Titans. 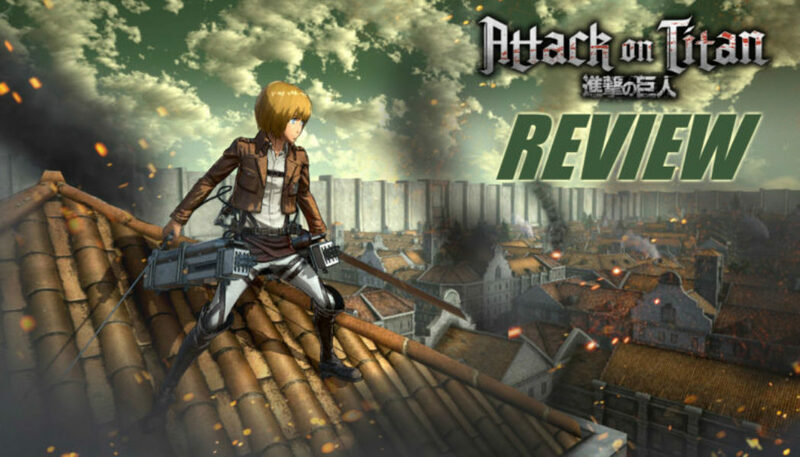 You get to play as all the key characters in the anime – Eren, Armin, Mikasa and Levi. 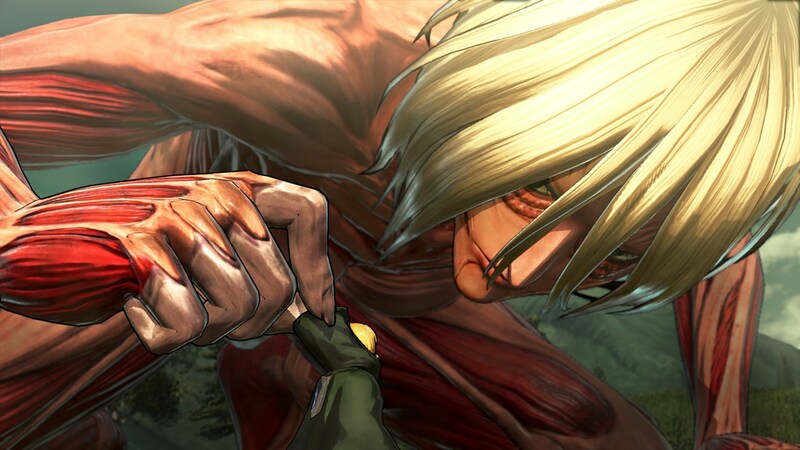 But the character with the most difference in terms of playability is perhaps Armin, and that too because he is individually not much of a warrior, but can issue instructions to squad members on the field. With the others it’s mostly aim and slash, though Levi’s Rotating Slash looks pretty kickass. After credits, all you get is a glimpse of a gigantic ape Titan, but the world of Titans is still shrouded in mystery. There’s no mention of where they come from or why they only feed on humans. Agreed, you could read the manga or scour the internet, but dammit, the game could have so much more. Decision based choices, dialogue that might deviate from the original, flashbacks of past times when the Titans had appeared for the first time, the possibilities are endless. The story mode doesn’t last more than 7.5-8 hours at max, and releasing it as a full priced action title seems a little unfair at hits point. For those looking fill the hole for the desire to watch season 2, A.O.T Wings of Freedom can serve as a pleasant distraction. It’s adrenalin-ally exhilarating in short doses. But the spectacular ODM gear-powered movement won’t be able to provide the excitement you’re looking for in the long run.